Today we have a great blogger gracing Me & Marisa from across the pond. Her name is Pearl Westwood and she lives in the UK. We became blogger friends not too long after Me & Marisa launched so I’m so thrilled she agreed to do a guest blog for us. Her style is avant-garde and always original paying homage to classic looks mixed with current trends, not to mention she is one of the best bloggers I’ve ever seen at picture refferencing to prove her points and showcase her topics. Without further adieu, I give you Pearl Westwood :)! P.S. Check out her blog at Fashion Pearls of Wisdom, it’s on the right hand column in our blogroll! 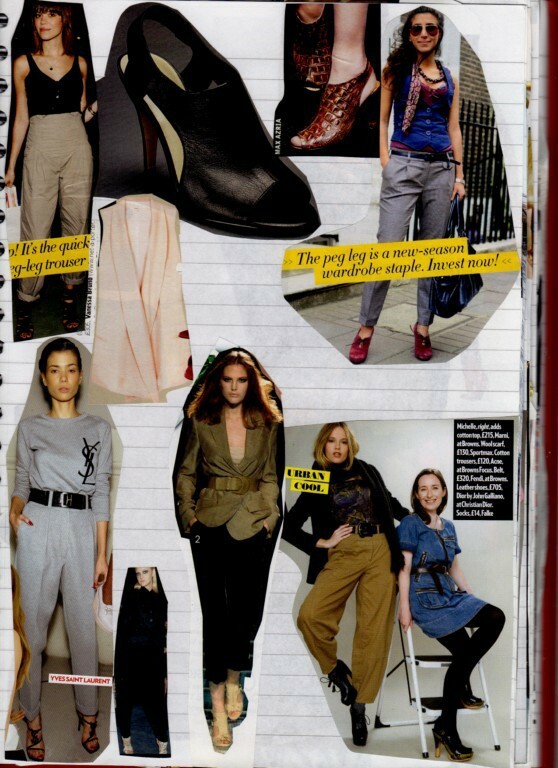 If there is one thing us Brit girls are obsessed with it is US girls’ style and so of course girls in the States want to know all about UK girls’ style! I think the main thing with British style is that we mix it all up and have a really eclectic and laid back approach to dressing. 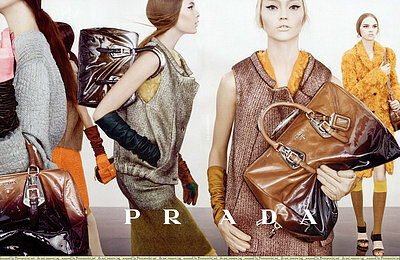 I think this is why we are trying to steal your Olivia Palermo, we love that perfectly polished look. So here are some of my style influences for two of my favourite outfits. 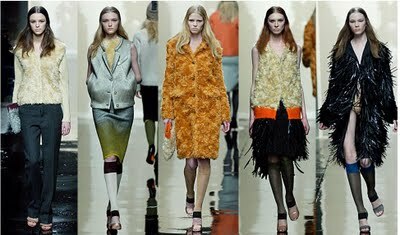 The Prada 2007 A/W collection has to be one of my absolute favourite so I am always on the lookout for pieces from it. In the second outfit I’ve used the bright bag to add a colour pop to the black and grey. In the first outfit I have taken influence from Mulberry’s colour clashing and piled on the orange and pink, but grounded it with the blue jeans. I have a huge scrap book which I used to keep track of colour and styling forms that I really like, then when I need some inspiration I can just flip through the book. 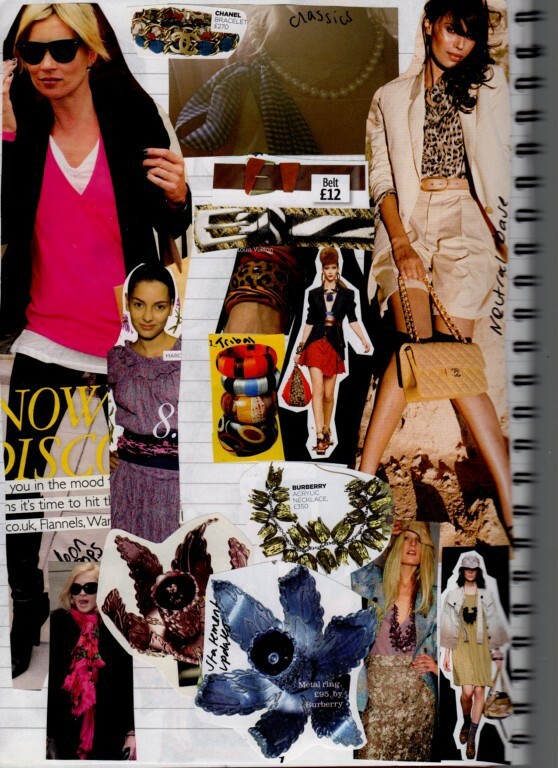 These are the pages that inspired these two outfits. Finally I couldn’t leave you without some photo’s of Alexa Chung (if you don’t know Alexa she is our Olivia), as I think her style really represents what us Brit girls are all about! Karl Lagerfeld and the House of Chanel absoultely out did themselves for their Pre-Fall 2010 line. Hands down my favorite line from the season. I’ve never fallen in love with a line as much as I have this one. Everything from the set design to the color palette of the clothing (which by the way encorporated my three favorite colors HEAVILY; Black, red and gold). Sorry I didn’t get this up yesterday but I had a 103.3 degree fever and was shaking kinda uncontrollably… I feel a lot better today, though not 100%. Anyway, enjoy my favorite picks and hope you’re having a great weekend! These three looks really rose to the top for me as favorites. There’s something very aristocratic and almost Gothic fantasy about them. Here is the second part of the weekend. We stumbled into this really great store on Campus Corner called the Antique Garden. I’ve seen it a million times, but have never gone in until this weekend. Not only do they sell antiques, but also clothes. Found some really cool stuff for my sister from a designer named BB Dakota who apparently is from Canada. Enjoy! Hope it’s sunny where you are, all we have here are clouds and mist. This is my favorite statue on campus! Such great stuff in there, check it out if you’re in Norman and haven’t already! And now on to part two of our special Labor Day recap presentation brought to you by my mother’s birthday and the Cherokee Pow-Wow. I’m loving the fact this is a short week. Might head down to Dallas this weekend… But Marisa is in the dorms and my other friend who I was planning to crash with is coming up to OU for the game. So may not be able to make it to see her till 2 more weeks from now! Sad face :(. Oh well, first things first, purchases lol. Enjoy! First off is this great camel hair coat that fits me like it was tailored just for me, which is hard to find because I have really broad shoulders and a freakishly small waist ha, but I love it! I thought this present was very pretty and I got a little obsessed with it and it looks like it’s the only one I photographed from my mom’s birthday lol. I didn’t even get a picture of what I got her (two tops, one of which was leopard and I wasn’t sure she would like, but she LOVED). My mom has the pictures from the event on her camera. I’ll get a shot of what I got her and post it later. My sister got her those pearls, and you can kiiiinda see the corner of a bright green package, but again, I was all excited about the pretty wrapping lol. Me and shiny objects. Made her wear the ribbon as a scarf haha. The colors were SO amazing! That dude in the pink was so freakin tall! I finally got the pictures from Vegas that my mom and sister took after my camera died. So as promised, here are a few of my favorites. Enjoy! This girl was the best in the whole show. She needs her own show!